How would you like to start out in a career field where every single method and trade secret was exposed, all that was is gone and shattered, and now what do you do? Elaine, Ryan, and I went to the Palace Theater in Canton last night to watch the Battle of Magicians and a fun night it was. Also, it was the night of the "SuperMoon", so it was a very mysterious and cosmically heavy occasion. I enjoyed all the performances, they were all top-notch, but I wanted to focus in on the three young guys performing, Eric Buss, Jason Hudy, and Trigg Watson. Back in 1997 or so, The Masked Magician had a series of Fox Network specials where he broke, or should I say destroyed/obliterated, the Magician's Code. The Code is, you never tell how the magic is done. You never do the same trick twice for the same audience either, but that lesser part of the Code has been twisted, bent, ignored, or forgotten. For several years, The Masked Magician did the unthinkable by divulging the high secrets of many of the world's and time's great magicians, illusionists, and magic practitioners. I talked to a few magicians during that time and after who were fortunate that they still had work or they secrets were not revealed, but they told me horror stories of magicians who lost work because everyone knew what they were doing. I heard about a magician with a big Vegas gig who was fired on the spot due to The Great Reveal. The Masked Magician did what he did for whatever he reasons or rationale was, but the experience left a sour, bad taste in my mouth. The field of magic was never the same. But what about those of us who started young like me who took the Code seriously? How do you continue in your line of work or your life's passion knowing that the magic's gone and the trick and trickster has been exposed? 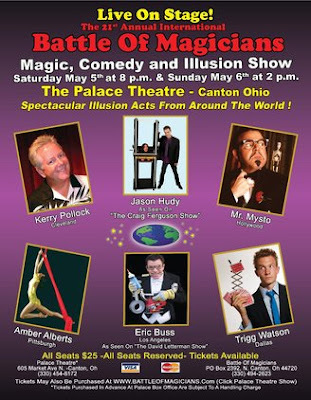 We have attended magic shows or watched TV magic shows down through the years since then. I have seen magicians perform the exact same illusions and prestidigitations that were laid waste. I always assumed that they thought time heals all wounds and perhaps the audience never saw the Fox shows. That was the easy explanation and that could be. Last night, I finally realized how true purveyors of the art dealt with the great outing, you go on and you find a way. I noticed their big illusions with something strangely familiar about them. When you think about it and dig down deep enough, you could actually find the core or root in some of the good old hocus pocus, but they were so updated and modern, they bore little resemblance to The Great Reveal. I doubt that anyone in the audience would even recognized that what was broadcast fourteen years ago and what I saw last night were much related unless you really did know the secrets. Time not only healed the wound, but what has emerged is something even better, more creative, and more magical. Back to the young magicians. If you are going to do the same revealed abracadbra, you better have a reason for it. These three guys especially showed such skill, even if you knew the workings, you marveled at how they put it together, performed it, and pulled it off. Knowing how it was done, you still applaud at their showmanship and the talent. Time moves on. I am very excited about this new generation of magicians and encourage them and all young people to follow your dreams, shoot for the stars, and find a way around or through the adversity. It is refreshing for me to see.